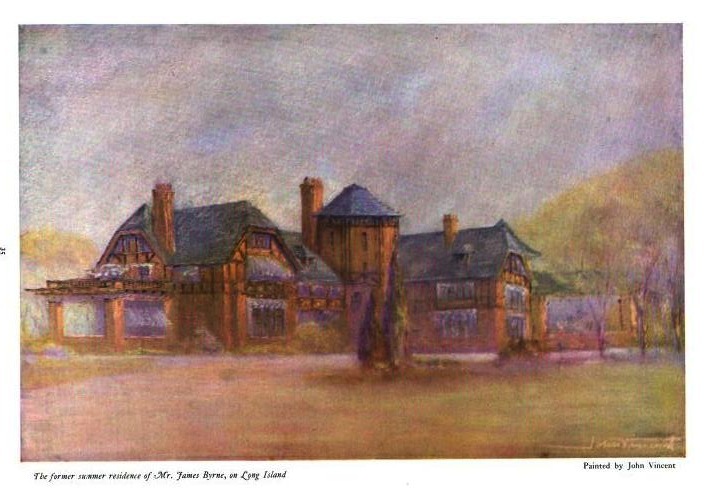 The James Byrne estate designed by Grosvenor Atterbury c. 1906 in Oyster Bay. Byrne was an attorney and partner in the firms of Carter, Hornblower & Byrne and Byrne, Cutcheon & Taylor. The house was purchased by William R. Coe c. 1913 and burned to the ground in 1918. 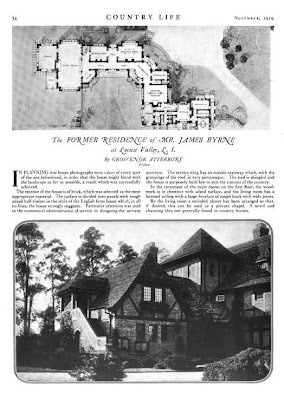 Coe then hired Walker & Gillette to rebuild on the foundations of the Byrne residence. Click HERE for more on 'Planting Fields', the Coe residence. Pictures from Country Life, 1919. 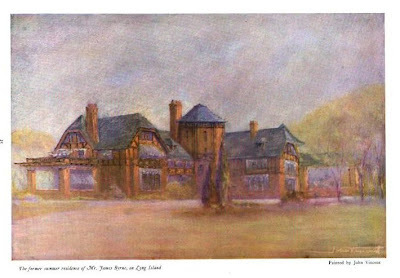 The Byrnes (who were the parents-in-law of Walter Lippman) went on to Bar Harbor, where they bought an estate called 'Guy's Cliff' and had Guy Lowell (who had nothing to do with the name of the estate) remodel the large Victorian cottage into quite a grand Italian villa, which became a monastery after Mrs. Byrne's death. It burned down, sadly, in the 1970's. Thanks Zach, I didn’t realize this house preceded ‘Planting Fields’ by Walker & Gillette (there were too many fires back then). The floor plans & general style of both houses are similar but the Walker & Gillette exterior is grander – not surprising since Grosvenor Atterbury wasn’t known for grandeur. It also kind of explains why the interiors of ‘Planting Fields’ are surprisingly plain (& not, for example, heavy Jacobean) – the Coes must have liked their Grosvenor Atterbury house that burned down. The photograph Zach posted is of the service wing (very good looking); on the ground floor: the three windows to the right of the stairs are to the ironing room; to the right of that is the kitchen & part of the butler’s pantry (can’t really see the windows); & then turn the corner & there are windows to the dining room. I’m glad I’m not the one who had to haul trays back & forth between the kitchen & the living room on a regular basis. DED - any remnants or location info? Where any of the outbuildings at Planting Fields Atterbury's? I believe all the outbuildings by Atterbury still stand. The question on the outbuildings - which ones are Atterbury's and which ones are W/G? The caretakers house (between Coe Hall and the Manor house), the garage (now a used book shop), and the laundry house. I believe all those structures are Atterburys. torn - torn - i like them both. early one much more simple but jacobean stone is nice too and the outbuildings are nice too and for once the gardens were the focus and not something to be deleted in the modern world. security word def - "jugon" - Olde English word for drunk as in "e's got a proper jugon"